One of the most important considerations taken by a knife owner is a good working edge on their blade. Unfortunately, sharpening is not always as easy as it may appear. 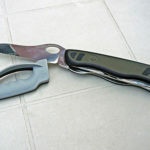 Common challenges are determining how to hold the knife to the sharpener while being safe and the best angle for sharpening that will maximize the blade. Also, learning which type of material is the best for sharpening and how much sharpening is required. Smith’s CCKS 2-Step Knife Sharpener removes these many challenges and makes knife sharpening fool proof. 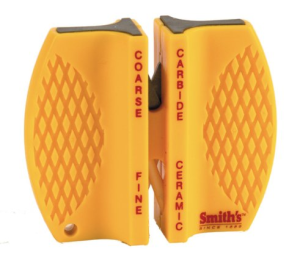 Smith’s CCKS 2-Step Knife Sharpener is a compact yet effective knife sharpener with a plastic handle and two tungsten carbide inserts designed for the coarse side and two 1500-grit ceramic inserts designed for the fine side of the knife. The carbide inserts essentially shave steel from the knife this creating a finer, sharper edge. The product is 2-5/16″ x 2-3/4″ x 7/8″ and only weighs 1.5 ounces. The provided instructions should be enough to get you started. First, prop the knife on a surface that will is acceptable if it is cut. The key word here is surface, not let or any other body part. Second, grip the textured handle on one of the wings and press the blade down into the metal inserts with the blade cutting edge facing down. Always begin the process with the coarse side to maximum effectiveness. Next, in one motion, pull the knife blade through the two inserts while exerting a downward pressure. The same steps must be followed to create a finely-honed blade. The carbine inserts will shave bits off of your blade to create an extremely sharp knife. If you choose the ceramic inserts will create the fine side. Since a rougher blade is a better option for cutting tough material, many advise to not run the fine side of the blade through the sharpener. There are a few benefits to using this knife sharpener. First, it is extremely light and compact for the ultimate in mobility. Despite its lightweight and compact body, this sharpener is extremely effective and can provide a fine blade. Another pro is that the sharpener is simple to use. With rubber handles to prevent slipping, it is as simple as running the knife between the carbide blades to sharpen. Additionally, the product is extremely inexpensive, despite its durable construction and high level of effectiveness. Finally, the product is a bright yellow color to easily find when you are quickly searching for it. Despite the excellent benefits, there are cons to consider. First, the entire unit is made in China. For those searching for a product made it the United States, look somewhere else. Second, the fine side ceramic inserts can be slightly too fine for some people’s tastes. Although this point is a matter of preference, may consumers find this to be a disadvantage because a finely-honed blade does not cut as well as a rougher blade. Additionally, this product was not meant for sharpening curved blades like skinning knifes. If you attempt to pull a curved knife through the straight blades, it could damage the knife or the sharpener so it is not recommended. The ideal goal of any product is to work to the consumer’s expectations. Smith’s CCKS 2-Step Knife Sharpener does exactly that: works. Although there is a slight learning curve to determine the ideal angel for sharpening, once you get used to it, this is a quick and easy method of knife sharpening. 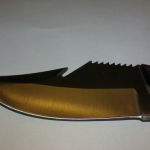 The design and construction are simple yet durable and the blades are extremely effective. This is an excellent sharpener and is a highly recommended purchase especially for hunters. Smith’s CCKS 2-Step Knife Sharpener is mobile (for the great outdoors) and produces the perfect blade. There are several benefits to using this knife and only a few minor drawbacks. Since the pros highly outweigh the cons, this sharpener should be in every kitchen, shop and with every hunter on their next trip.